I’m delighted to say that it was way better than that, and meant after hours of frustration, my Hay has kicked off in style. Which was particularly pleasing as my eldest, Beth (16) decided to come along at the last minute and I would have also hated to disappoint her. For those unfamiliar with Singh’s book, it tells the story of Andrew Wiles, a mathematician who was obsessed with solving Fermat’s Last Theorem. That puzzle was laid down by Fermat, who liked to writ e notes in the margins of his copy of Arithmetica. In one, he claimed to have proved a particular equation, but there wasn’t space to write the proof, thereby setting down a challenge for mathematicians for 350 years. Tonight’s talk was a celebration of twenty years since Wiles’ tremendous achievement. Fittingly, it began with an excerpt from the BBC film of the story in which Wiles is filled with emotion as he remembers the moment he knew he’d completed the proof. ‘We’ve all had occasions when maths made us want to cry’ Singh commented wryly, before taking us through the story and why it mattered so much to the mathematician. An obsession formed when he was ten, led to him spending years studying the theorem, till a breakthrough in a new field of mathematics gave him the tools for a possible solution. For the next seven years Wiles toiled away in secret, until he finally worked out a proof. Even that wasn’t the end of the story as the proof later turned out to have an error and it was another eighteen months before it was absolutely watertight. Singh is as an engaging a presenter as he is a writer, and he told the absorbing tale with verve and energy. Beth loved it. 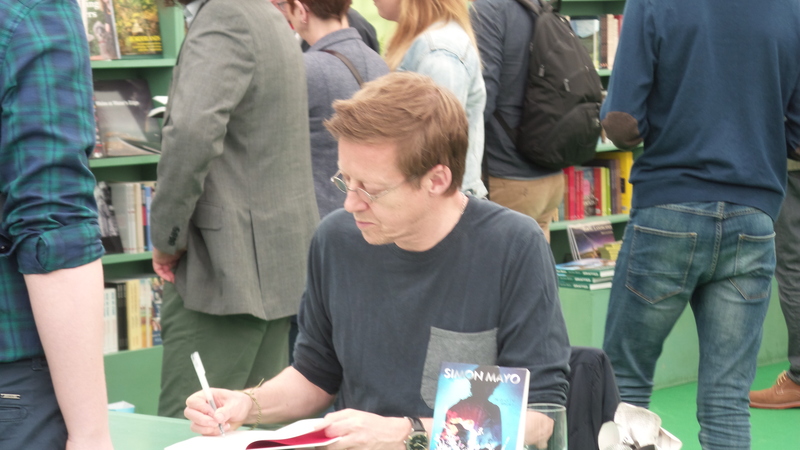 And when we met the author afterwards, he proved as engaging in person as he is on stage and page. So look out for his books, he’s well worth a read. After a somewhat wobbly start, my festival has begun.